What can I expect when applying for a loan? Will lenders run my credit? What are the fees and annual percentage rates ("APRs")? How soon will the money be available? When does the loan need to be repaid? What happens if I don't pay the loan back? What services are provided by this Website? What are the codes of practice and policies on responsible lending? Financial emergencies seem to happen at the worst possible moments. The state of our economy over the past few years has left millions of people without a financial cushion to rely upon when a monetary crisis occurs. An unexpected car repair, a broken water heater, a bill that absolutely must be paid immediately - whatever the circumstances, cash loans can be a financial live saver. The process for obtaining a cash advance loan is simple. All you have to do is fill out a secure online application form which generally just takes a few minutes. Most payday loan companies have minimal requirements for applicants but it's important to note that not everyone will qualify for a payday loan. Once approved, the funds can be deposited into your checking account sometimes within one business day. Allow the lender to withdraw the full amount of your loan (including interest and fees) from your checking account. Go to the actual physical storefront of the lender and pay off the loan in person. Extend (or rollover) your loan for another two weeks, if allowed. State laws vary with many states forbidding extensions of payday loans and others limiting the amount of times you may extend a payday loan. Be sure to check for the specific regulations for your state. Also remember that any extension will come with additional fees and interest. Just be a United States citizen over 18 years old and have a steady monthly income of at least $1000. Do not worry if you have bad credit as your loan approval is decided on numerous factors including but not limited to your monthly income, outstanding debt, length of your employment, etc. Borrowing is a serious responsibility and you should have confidence in your ability to repay a payday loan in full when it is due. Once a person submits a completed application form with the required information through this website's secure application page, lenders from our network will review the data provided and then decide whether to offer the applicant a short-term loan. Generally this online approval process requires no more than a couple minutes. Each lender has a unique set of terms and conditions, including APRs, fees and repayment methods. It is essential that an applicant thoroughly reviews and understands the terms and conditions set forth by the lender before entering into a loan agreement. Anyone using this website to search for online lending options is under no obligation whatsoever to enter into a loan agreement with any lender, at any time. If a lender contacts a user of this website to offer a loan, the user can either accept or decline any such loan offer. There is no obligation on the part of a user of this website to accept a loan offer at any time from any lender. Cashloan.org cannot guarantee the amount of funds for which you will be approved. Each lender determines the specific amount of a loan contract and also the terms and conditions of the loan. It is your responsibility to know and understand all the information contained in your loan agreement. If you have any questions you should contact your lender directly. Do not sign a loan agreement until you are satisfied with the terms and conditions. All lenders have their own lending procedures and requirements and may perform credit checks. Lenders may review and verify the information supplied by the applicant, including the Social Security number given, in national databases that track consumer financial transactions. The main databases are Teletrack, DP Bureau, and DataX. Having a poor credit history does not necessarily disqualify an applicant from being approved for a payday loan. Cashloan.org does not offer cash loans or advances of any times. We do refer applicants to lenders who may provide these loans. The cost of the loan and APR may depend on the information in your application. All fees and APRs may vary and are determined and administered by the specific lender. It is imperative that an applicant reads, reviews, and understands all of the terms and conditions contained in the loan agreement before committing to and signing a loan agreement. The amount of time needed to process a loan and wire or ACH funds into a borrower's bank account varies with each specific lender and may also be affected by the borrower's financial institution. Approved applicants may receive their cash funds within one full business day after approval notification. Each lender has its own rules and regulations regarding loan terms, including renewal policies and transfer times. Cash loans are meant to be repaid very quickly (normally within two weeks) and should only be used for true financial emergencies. The repayment period varies but it's usually when you receive your next paycheck and usually range in small amounts from $100 to $1000. All lenders are required to inform the applicant, IN WRITING, of all fees, APRs and repayment terms, before an applicant is asked to sign a formal loan agreement. The exact loan terms, including repayment dates and any applicable fees charged in the event of a late payment (loan rollover) will vary among lenders. The applicant should thoroughly read and understand all the information provided by the lender before entering into and signing a loan agreement. Borrowing money is a serious responsibility and should not be entered into lightly. If you do not pay the full amount of principal and interest by the agreed-upon date, you will most likely be charged a new finance charge. Review the late payment policy in your loan documents provided by your lender before signing your e-signature. Renewal policies vary among our network of lenders. All applicants are strongly encouraged to fully review and understand all loan terms and conditions as provided by the lender before entering into and signing a loan agreement. Be aware that if you fail to repay your loan, in accordance with federal regulations, the lender can start collection proceedings against you. To arrange payment, borrowers could be contacted via one or more approved methods, including phone and email. Late payments or delinquencies could also be reported to credit bureaus which could negatively impact your credit. The operator of this website provides a referral service for those consumers who are searching for online lending choices. Please note that Cashloan.org is NOT A LENDER and does not participate in the loan approval decision making process. Loan amounts, repayment terms, APRs, fees, and all other lending conditions, terms and procedures are specific to each individual lender. It is important that any loan applicant fully reviews the terms and conditions of the loan agreement before committing and agreeing to any loan contract. 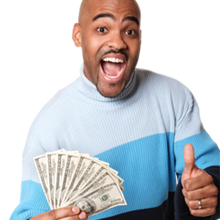 Short-term cash loans are meant to be used as a one-time solution to an emergency financial situation. They are not intended to solve long-term debt problems. Please Borrow Responsibly.